Our mentors are friendly, experienced TypeScript developers who will help teach you new techniques and tricks. TS adds a flexible type system to JS, in addition to interfaces (custom types) and modifying the syntax of some ECMAScript features such as classes. Types are optional and flexible (for example, you can specify an argument is a string OR a number). Types allow tooling available in most code editors that improve the development experience such as code completion and method detection, both in your own code and in packages you use. It supports many upcoming ECMASCript features (such as async/await). TS can be written in OO or functional styles. It is compatible with all existing JS packages. TS transpiles to clean, readable JS. Try it out at the playground, and stay up to date via the Typescript blog and Twitter account. 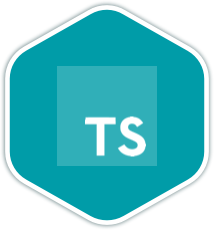 Once you join the TypeScript language track, you will receive support and feedback from our team of mentors. Here are the bios of a few of the mentors of this track. These are a few of the 87 exercises on the TypeScript track. You can see all the exercises here. The TypeScript Maintainers are the brains behind the TypeScript Track. They spend their spare time creating interesting and challenging exercises that we can all learn from. We are incredibly grateful for their hard work. Here are the bios of a few of the maintainers of this track. I'm a career-changer from education, and I used Exercism to reinforce my skills as I made the switch. I love TypeScript for the flexibility of JS with the consistency of strongly typed languages. Maintaining the TS track has grown my appreciation for the language. I am a Software Engineering student from San Sebastian. I enjoy a lot reading about topics related to Java, software maintainability and web technologies. My love for TypeScript began developing web apps with Angular framework. Get started with the TypeScript track. As with everything on Exercism, it's 100% free!